May your holidays be both merry and bright! Decorating the Pink Palace has been a longstanding Memphis Christmas tradition. 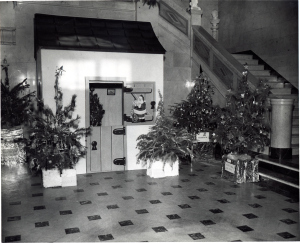 In 1951, the Museum displayed a forest of live, imaginatively decorated Christmas trees. The exhibit promoted fire safety and was co-sponsored by the Memphis Fire Department. At the opening, Santa Claus arrived in a fire engine. The trees were decorated with ornaments that were hand-made by Memphis school children. The ornaments were donated to local orphanages at the close of the exhibit, and the trees were planted on the grounds of city schools. The museum was a segregated place in the 1950s, and black citizens were only allowed to view the exhibit the Tuesday of the week it was open.